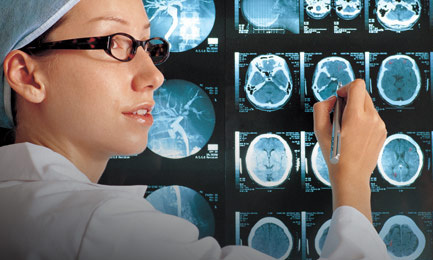 MRI has quickly established its diagnostic value for the field of neurology. The brain is relatively inaccessible with conventional methods, but MRI has enabled neurologists to correlate symptoms with changes in brain properties e.g. microinfarction, inflammatory events and brain tumours. Such biomarkers for disease and disease progression may also provide objective diagnostic measures for monitoring therapeutic progress. Interestingly, MRI also enables pychiatrists to visualize brain activity when individuals are either inactive (Default Mode Network activity), perform tasks or are exposed to specific challenges. The monitoring of default mode network activity or brain activity as a result of challenges can be used to evaluate therapeutic approaches and may serve as diagnostic or therapeutic biomarkers, i.e. efficacy read-outs by pharmaco-MRI. Moreover, as MRI can be used repetitively, it also resolves pharmacokinetic-pharmacodynamic issues where cause and effect may be (widely) separated in time. Furthermore, MRI recently revealed the behavioural and occupational impact on brain integrity. Irregular or persistent lack of sleep due to insomnia, shiftwork or long-haul flights affect brain organization and modify cognitive abilities as well as on the ability to make rapid and adequate judgements. In the case of long-haul airline pilots such schedules may present an occupational hazard. With MRI such brain changes may be recorded and be included in regular check-ups and job-related risk assessment for flight crews and shiftworkers.